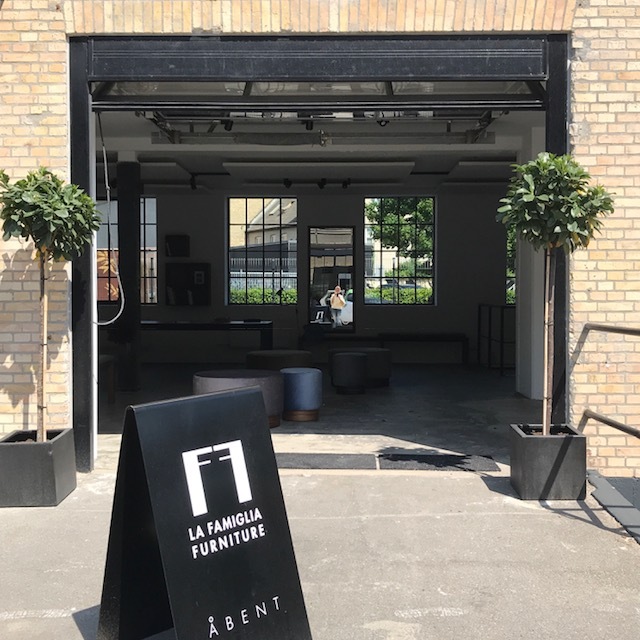 Join LA FAMIGLIA FURNITURE during 3daysofdesign at Glentevej 47, 2400 NV - Copenhagen between the 24th - 26th of May from 10am-6pm all days. I have been busy designing new items for LA FAMIGLIA FURNITURE which are exhibited during Salone del Mobile in Milan at Ventura Lambrate location 9 stand R. We are open everyday from 10-20. If you are in the area please come and visit. LA FAMIGLIA tables exhibited at Bredgade Open 2016. I hope you all had a great summer. Now it is time to get serious again, and we are happy to start off with a great event in Copenhagen center. In connection with Bredgade Open, which is an event created from all the amazing furniture, arts and design shops represented at Bredgade, LA FAMIGLIA will be exhibiting already from Tuesday the 16th of August three tables at GALLERY CHRISTOFFER EGELUND . One in walnut decorated with steel, one in smoked Oak decorated with brass and one in high gloss black laqured Oak with bench and leather cushions. Please join us for drinks and snacks Friday the 19th. of August from 11am-7pm and see the tables and arts. This is a very visual blog, see some of my dream bathrooms below. Most properly it will not be possible to have any of these bathrooms. But everybody is allowed to dream or at least get inspired. Complete with tiles and marble. Complete with stone and oak. Complete with glass and wood. Complete with mix of classic and modern. Complete with cabinet maker masterpiece in wood. Complete with stone and spa. Complete with strict architectural design. I am a big fan of Ashley Woodson Bailey’s who has created a collection of six photo-based wallpapers, which were launched not long ago. Wouldn’t they look stunning in a bedroom or teeny tiny bathroom? A former floral designer who taught herself photography — starting on her iPhone — while surrounded by get-well flowers after a car accident, Ashley has a deep love for natural shapes as well as design. 8 BEST BOUTIQUE HOTELS IN PARIS, ........ IN MY OPINION. We went to Paris and apart from all the wonderful buildings, food, wine and monuments you see all over Paris, you find some great hotels here, big and small. I did a little research on my dream hotels. Here they are. La Belle Juliette is located in central Paris, a short walk from Saint-Germain-des-Prés and the Jardin du Luxembourg. This hotel offers accommodation with an indoor swimming pool and Spa. The 4-star Bradford Elysées is set in a Haussmannian building, near the famous Champs Elysées in central Paris. It offers refined guest rooms and a breakfast room with a glass roof. Each of the spacious guest rooms at Bradford Elysées has a classically elegant déco. Located in the historical district of Saint-Germain-des-Prés, this 4-star hotel features a hammam and steam room. It offers Baroque-style guest rooms and was home to the late Oscar Wilde. We stayed here last time in Paris. It´s a great small boutique hotel with a lovely staff, soft and delicate interior and a great restaurant. Hotel Lancaster is a boutique hotel dating from 1889, located just 100 metres from the Champs-Élysées. It offers a classic and elegant atmosphere and its own Michelin star restaurant. Rooms and suites at Lancaster are furnished in luxury fabrics and grouped around a central Zen garden. Some rooms have a separate lounge, a private patio or views of the Eiffel Tower. I would love to stay here, but the changes are quite small ! Mid-way between Rue du Faubourg Saint-Honoré and Avenue Montaigne, a stone's throw from the Champs-Elysées, where the heart of Paris beats. Nestled in a peaceful location, slightly set back from the world's most beautiful avenue, La Réserve Paris – Hotel and Spa overlooks the Grand Palais, the Eiffel Tower, the Pantheon and the Concorde obelisk. Just in front, a majestic curtain of trees preserves the intimacy of this place, like an echo of the Elysée gardens nearby. Enjoy dreaming and go to Paris, Christina. Shugaa is a dessert bar by a Thai chef who made creative menus and plated desserts that aways surprise and amaze the customers..The concept of the interior design had been researched from the base of sugar molegules and crystals. Seeing from the outside through the glass wall, there is polygon installation hanging around the front that is inspired from sugar crystals. Besides, wood material also had been used in the design together with mint green colour to make it feel warm and earthy. The designer team have added a dash of modern and luxury by using rose gold colour elements and a marble counter bar..The first floor is connected to the second one by a spiral staircase. This is the highlight of the dessert room: a sugar crystal staircase created by arranging acrylic box along the spiral staircase which is the icon of the Shugaa dessert bar. When customers walk to the second floor, they can view the dessert preparation. Step further to the final zone, there is the private area that is an ideal and quiet place for having dessert while reading and working. Following the 2015 presentation of the gilded Pipistrello to celebrate the lamp’s 50 years, and the smaller Minipipistrello, Martinelli Luce celebrated Serpente fiftieth birthday with a limited-edition gold version..An iconic object – since 1990 a fixture at New York’s Metropolitan Museum of Art – born of research into an “esprit nouveau” in which the geometry of the form coldness of strict purism and acquiring an emotive impulse softened by sinuous curves..The curvilinear form of Serpente is highly complex and the definitive version was achieved only after production of numerous prototypes. The difficulties posed by the geometry of the lamp required that new methacrylate molding techniques be developed before the diffuser could be manufactured. The curve of the tubular arm also posed technological challenges and required use of production techniques that were innovative for the time: with its distinctive S-curve, drawnd by the rotation of the arm, the lamp looks much like a snake exploring its environment. Very near to our own house in Copenhagen, you find this amazing house designed by Nicholas Rahbek Ernst. When Astrid Bruus Thomsen and Jesper Walther Sorensen for daily dealing with architecture and urban planning, is a basic understanding of and fascination of what the beautiful architecture can do to people's lives and well-being. The dream of drawing and design their future home was an option as the practical reasons had to move from their farmhouse at Roskilde Fjord and was given a rare opportunity to buy an ideally located plot overlooking the lake and forest near the Great Deer Park in North Zealand . The only materials that they would like to included in the house were: concrete floors, wood ceilings and walls and large glass panels to encapsulate the nature around. In fact, a modern interpretation of a 60's villa. Light is so important for all of us. The Argentinian architect Aldana Ferrer Garcia has designed this brilliant " fold-out " window MORE SKY which makes it possible to get more light and better view from streets and sky without getting in noise and smog while living in bigger cities. The window works as a gigantic street mirror. Aldana Ferrer Garcia designed the window while attending Pratt Institute i Brooklyn i New York and the window is exhibited at Dubai Design Weekend these days to find investors for the project. JANUARY 11, 2016 by LUCY GRAPH for KNSTRCT. Brickell House is the centerpiece of Miami’s newly developed financial district, a 600-acre bay-front enclave south of downtown. With interiors designed by George Yabu and Glenn Pushelberg, co-founders of Yabu Pushelberg, Brickell House brings the class and sophistication of Upper West Side New York straight to Miami. Combining elegance with an urban atmosphere, the design team at Yabu Pushelberg outfitted Brickell’s 370 units, three-story lobby, and two lounges with a harmonious pallet of warm colors and raw materials. Guests feel the elegance of the interiors upon entering the condominium's lobby, where American Black Walnut and stone sheets clad the walls adjacent to a spectacularly mirrored spiral staircase. A custom built, tufted mustard sofa doges metallic coffee tables as it curves through the lobby. In the Club Lounge, Quarter-Sawn Slip Match American Black Walnut is the visual voice of the kitchen area, differentiating it from the unique floor to ceiling screens used to partition conversation areas of the Lounge. The two screens, are constructed of Black American Walnut veneer and solid wood with painted inset panels, each rise fifteen feet from the floor and span fourteen feet. Two, twin curved island units, fabricated by layering wood in order to highlight the joinery of the wood ribbons, are featured in the Owner’s Lounge and the Club Lounge. Their glossy finish accentuates the variations in the colors of the wood and the joints at the rounded ends of the units; making this sleep piece a major interior attraction. The Brickell community is setting a new bar on luxury for Miami and the Brickell House is pushing that bar even higher. I was invited to attend the F/W 2016 fashion show by danish brand, by Malene Birger last week during Copenhagen Fashion Week. The show was held in Ny Carlsberg Glyptotek next to TIVOLI in the center of Copenhagen. An awesome location, which was kind of my " home " , as I was sketching for at least a couple of month here, during my years of studying design and architecture. The show was amazing, and I can´t wait to get my hand on the wide high waisted pants and great fur coats from the collection. I see the 40´, 50´ and 70´ in this collection, which is very mature and elegant, and with great color. F/W 2016 show at Glyptoteket. F/W 2016 great color, elegance, chopped high waisted pants and lovely fur. by Malene Birger headquarter Copenhagen, Frederiksberg. by Malene Birger headquarter in Copenhagen, Frederiksberg. Interior at by Malene Birger headquarter, super stylish and feminine. I was in a meeting here not long ago. What a beautiful place to turn up for work every morning. Birger1962 interior studio, with great inspiration from all of Malene Birger´s travels around the world. 2 opposite hotels in Copenhagen, which are both amazing, in each their own way. This is a hotel with only 1 room, but what a room! Located on top of a small café in the Vesterbro neighbourhood, the double room of Central Hotel has a unique interior design with beautiful handcrafted details that will make even the pickiest boutique hotel aficionado feel right at home. Central Hotel og Café is located in the Vesterbro neighbourhood right on the border of Frederiksberg. It is a lively and trendy area in secure distance to the city’s tourist traps. Around the corner is Værnedamsvej, the cosiest street in the city. For nightlife there are many restaurants, bars and cocktail bars in the immediate area. Close by is the old meat packing district (Kødbyen), with clubs, galleries, cafés, bars and restaurants – not to be missed! This 5 star luxury hotel has been refurnished a few years back, in an amazing style. It´s situated in the absolut center of Copenhagen near the charming port of Nyhavn. Just around the corner you will find great shopping and restaurant. The hotel originated from a result of a love affair between two young people. In the mid-1700s, fell in love Jean Marchal, serves at the Danish court, and Maria coppy, daughter of the court chef himself. Maria was known for his talents in the kitchen and Jean knew all about how they served the privileged. Together established Mr. And Mrs. Marchal a restaurant on Kongens Nytorv in 1755. This is where d'Angleterre's story begins. Hotel d'Angleterre's identity has been worn for more than 260 years of history of the founder Jean Marchal and his successors, talent and sense of providing service, hospitality and comfort of the highest class. It is this tradition that makes up the foundation as d'Angleterre is built.Hotel d'Angleterre was established in 1755 and is as legendary Copenhagen institution famous for its elegance, luxury and style. The hotel has undergone a transformation and is based on the area's rich history has been relaunched as a revitalized grand palais. The hotel's history and style complemented with new and intuitive services that speak to today's sophisticated traveler. Lovely place to stay. Enjoy you stay in Copenhagen, and remember to contact me for a guided design or fashion tour at DESIGN TOUR on this site. I have got the blues. I dont know if it´s because I really need a clear sky or what. But I am craving the color blue. Apart from what I want or need I am sure that blue is going to used a lot in interior in the future. Blue is that calm and pure color which has a great effect on most people and it can be mixed with almost every other color without giving you any problems. "This color is one of trust, honesty and loyalty. It is sincere, reserved and quiet, and doesn't like to make a fuss or draw attention. It hates confrontation, and likes to do things in its own way. From a color psychology perspective, blue is reliable and responsible. This color exhibits an inner security and confidence. You can rely on it to take control and do the right thing in difficult times. It has a need for order and direction in its life, including its living and work spaces" I think this describes the color spot on ! See below and get inspired from the pictures I have found of interior using blue for this newsletter. Go dark and all the way with marine blue walls, very royal. Less dramatic , mix a lighter blue and white, to get this sophisticated look. George Jensen has launched these wall watches recently. Spice up with applied arts like vases, glasses or other like these from Louise Roe. The bath is the first obvious place to use blue, use tiles or towels to to make room interesting. Some of my favorit tiles are from MADEAMANO. Interior for men, stylish and cool. How great would it be if I were to design an interior for a man. This is for sure one way I would do it. When you speak about interior most people think about women. Guy´s like it stylish too, they are just a little afraid of making it too posh, but cool it has to be. I will give you an example of how I would do it, see below. For the livingroom, I would bring in darker color, lots of wood and leather, make space for Playstation, wide screen and very few books. I would bring in great comfortable leather chairs like this one from Rooster decor without it having to be a " Lazy-boy" like the one Joey from FRIENDS, loves so much. As for the bedroom I would not put in mirrors in the ceiling !!!! But some raw materials to get the prime drive through. And as for the bath, wood and concrete , Wash´n Go, as simple as possible, the way it should be for any man. Georg Jensen, danish when it´s best. New to Mayfair’s Mount Street is Danish design house Georg Jensen’s Art Deco inspired flagship boutique. The 2,000 sqft, two-level space is the realization of Copenhagen-based interior architecture practice Studio David Thulstrup with a meticulous, contrasting interior space inspired by geometric, Scandinavian and Art Deco references that stem from Georg Jensen’s rich brand history. High in contrast, the store’s dynamic, black steel elements lead shoppers through the experience, while simultaneously introducing them to Jensen’s bespoke creations. The stark white walls and floors provide a sophisticated canvas for the dark walnut partitions, vertically slatted to create a intimate space. The first floor is broken up into two merchandise categories; the gold and silver jewelry. All jewelry is showcased in display boxes which are integrated into the walls, specially designed to carefully highlight the delicate details of the Georg Jensen pieces in an impactful yet minimalistic way. Thulstrup employs linear lines and repetition in different ways throughout the space; creating a similar but unique experience for guests. The counters are outfitted in hammered terrazzo, a clever reference to the art of silversmithing and hammered silver. Follow the white stairs down to the basement, strategically divided into three areas; a room dedicated to the hollowware, a private sales area, which showcases the heritage jewelry collection and at last a private seating area for VIP clients. The room for hollowware is light-filled, with a centered custom-made wooden table designed by artist Laura Bergsø. Contrasting the linear shapes of the space, the curvaceous table is rustic, with timber tope left in natural state and a poured inlay of silver. Danish pure and clean design. The amazing wooden dividers brings great texture to the room. The lovely raw and massive wooden tables breaks the clean interior design in an interesting way. The massive natural pieces of wood are brought all the way from Denmark, to be more accurate, from Køge south of Copenhagen, which is the same place which deliver the wood for the tables in my new " LA FAMIGLIA " furniture collection. CASA CHRISTINA is proud to present " La Grande Mamma ". I was amazed, happy and grateful to all of you, who came to visit in great spirit and with lovely words at my first small event to show you my newly designed table " La Grande Mamma " from the series " LA FAMIGLIA ". Let me present to you " La Grande Mamma " . She has been with me always, but finally I can present her to you all ..... " La Grande Mamma ". I call her "she" and " La Grande Mamma ", because she is the first and biggest and most important in my new furniture collection - LA FAMIGLIA . And as we all know, it´s always Mamma who gets everybody together. Before I became a mother myself, it would be my mother and before that, my grandmother . I designed " La Grande Mamma " many years ago, for my house in Sicily. The table represent to me, togetherness and happy times, which I usually spend with my family, so this is the reason I have named the collection - LA FAMIGLIA. My family could easily be Italian. I dare say, we are maybe even more Italian, that most Italians. On top of that, being married to an Italian and also having had all of his family around the past 22 years, I would say I pretty much qualify to know a little something about family, gatherings, coziness, giant lunches and dinners involving a table. My first sketch of " La Grande Mamma "
Join us for a glass of bubbles at the SPOTLIGHT EVENTS showroom Tuesday 15th of December from 3 o’clock St. Kongensgade 103, 1264 Copenhagen - and see the real thing. Blue home next to The Danish Royal Theatre. I found these amazing pictures in BO BEDRE , the danish interior magazine, taken by KIRA BRANDT and styled by GlottiPress . 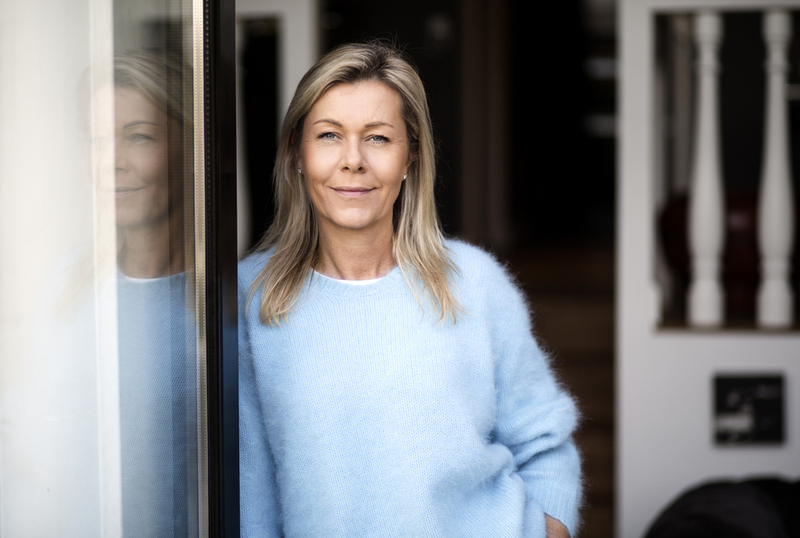 It´s the private home of NINA NYBORG, which she has created from her trips around the world and favorite shops in Copenhagen like OLIVER GUSTAV, FIRED EARTH, TAGE ANDERSEN, GREEN SQUARE, RUE VERTE, GALLERIE EGELUND, all my favourites as well. It´s such a lovely mix of new and old, blue and light colours, cozy and clean. LOVE LOVE LOVE . The blue color is going to be used a lot in the future I am sure. Enjoy these great inspiration pictures below. What a lovely mix of delicate blue velour and oak . Lovely mix of new and old. Private coral in Oliver Gustav decor. Light blue chairs against heavy dining table . The amazing tiles from Fired Earth gives such an interesting breath in a simple bathroom.